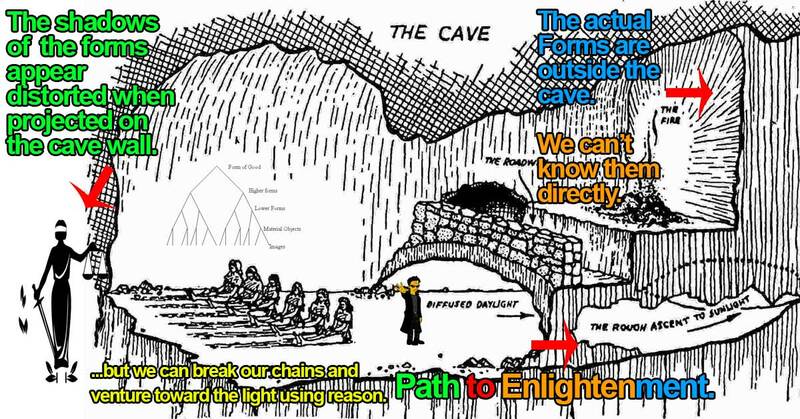 First we explain Plato’s Allegory of the Cave, also known as Plato’s Cave Metaphor (a metaphor for enlightenment, the noumenal world as it relates to virtues like justice, and the duty of “philosopher kings”), as that allegory is a metaphor for Plato’s Theory of Forms. Then we’ll discuss the “essence” of the theory of the forms (we’ll discuss the philosophical concepts behind the theory and discuss how we should understand Plato’s metaphysical points from a modern perspective). See the links and videos or Plato’s work itself for a nuts and bolts summary. NOTE: Below I (the author) am using my own modern words to retell Plato’s theory and allegory. I’m also combining Plato’s general theory and even borrowing a bit from Aristotle and Kant to paint a full picture of what Plato means. Check this version against Plato’s own work if you want specifics. This page is all about helping you to understand the essence of the Theory of Forms (which is a theory that Plato lays down in many works, and which countless more works have picked up). TIP: The allegory of the Cave is presented in Book VII of the Republic, Plato’s theory of forms describes the general theory this allegory is speaking to and is presented in a few works including Plato’s Pheado, and then in Republic and Phaedrus. The theory as a whole is part of Plato’s general theory of physical, logical, ethical, and metaphysical enlightenment that covers everything from morals, to ethics, to virtues, to statesmanship, and to epistemology. Other related theories are Plato’s theory of dialectics, the analogy of the sun, and the analogy of the divided line. I suggest checking out Books VII and VIII of the Republic for these theories, and then also IX for Plato’s theory of the Five Regimes (its all loosely connected). See an overview of Plato’s Republic. Before we get into the essence of Plato’s theory of forms, let’s quickly review the text-book version of the most famous of metaphors he uses to explain the concept, his Allegory of the Cave. What one would today call “Plato’s cave metaphor” or “the allegory of the cave” is presented by Plato’s Socrates in a conversation with Glaucon (his philosopher friend) as a thought experiment pertaining to enlightenment in Plato’s Republic (so they can define what qualities a guardian class philosopher king and/or auxiliary should have; i.e. it is part of a larger conversation on “how to create an ideal Republic”). The gist is this, prisoners are chained in a cave, only able to look forward at the shadows on the wall. The shadows they see are real to them, but in reality the shadows are just the shadows of real objects in the room and shadows of the prisoners themselves being projected on the cave wall from a fire behind them. The sounds they hear and images they see are real to them, even though they are unaware of the true source. So, so far we have: shadows of objects and prisoners on a cave wall <- prisoners chained with their eyes only able to see forward <- objects in the room being projected on the wall <- a fire in a cave. Then, we imagine prisoner breaks free and look toward the objects being projected and the other prisoners. It is uncomfortable at first, but they adjust to realize the shadows were less real than the objects! Then they look at the fire, again it is difficult and uncomfortable, and the ex-prisoner see that even those objects weren’t as real as the fire! Once they calibrate to the new setting they realize it is their moral duty to inform the other prisoners. Here there is two problems though, 1. the ex-prisoner’s eyes and ears are no longer well adjusted to the world of the cave wall (the world of becoming), 2. as so far as the ex-prisoner can communicate his thoughts, the current prisoners don’t exactly believe his tales as they have no frame for understanding these “non-shadows”). Then, the pilgrim (the fool, the hero, the sage, the ex-prisoner, the philosopher) begins a steep and rugged ascent outside of the cave. Each step in his journey is difficult, each feels like it did when he first broke free (bewildering, overwhelming, uncomfortable, emotional, etc). Upon reaching the outside of the cave he sees reflections in water, then looks up to see those reflections are of real objects, then again to see that this is all coming from the sun. The sun burns his eyes, but finally he says an approximation of the true source. Here the sun, the forms, and enlightenment are all represented by the sun (as we move from becoming to being, from the darkness of the cave toward the true light, as we put aside shadows on the wall and see more true versions of the forms, we become enlightened). The sun, that true fire which the fire in the cave was only mimicking, was the true source. TIP: The sun is the traditional symbol for enlightenment from this story on (not just in Plato’s work, but literally in the West). To approach knowing “the sun” is to be enlightened, to approach knowing it is to approach knowing the arete of the forms in each category of the physical, logical, ethical, and metaphysical. The pilgrim has journeyed from becoming to being, he has become the sage (or approached becoming the sage rather; wisdom is a journey, not a destination). Excited by his enlightenment, the sage (philosopher king) reenters the cave, but the problem he had before when he tried to enlighten the other prisoners is now ten-fold. His eyes can’t adjust well to the darkness of the cave. Conveying enlightenment in words isn’t ideal (why sophistry doesn’t work), instead enlightenment is understood by experience, by breaking the chains and making the rugged ascent. A philosopher king who wants to be able to teach people must know both the cave and the outside world, they must know the shadows and the true forms, then they must guide prisoners on their pilgrim’s journey. It isn’t enough to just go down to the cave and lecture the prisoners on the outside world. This is why dialectical reasoning is used, it doesn’t tell people what to think, it makes them consider “opposites”. PLATO ON: The Allegory of the Cave. The fools journey from Tarot is heavily influenced by Plato… just like everything else. See more on how to understand the Tarot. These FORMS are FORMAL (rationalizations, ideas, not physical things). However, despite them not existing first-and-foremost in the physical world, they are none-the-less constant and real things. The problem is, we can’t see the forms directly, and instead can only see traces of them in the physical world, like shadows on a cave wall…. and, when we do see the shadow of a form like “true justice,” we never really see it in its ideal form (it is always imperfect and distorted). Of course, this is all essentially the point of the metaphor. Said plainly, Plato’s Theory of the Forms is the idea that concepts like beauty (purely formal forms) exist as constants outside the physical realm. Meanwhile, Plato’s Allegory of the Cave is a metaphor for understanding this concept. Plato’s metaphysics and idealism can be challenging to some readers, Aristotle for example thought so and presented a much more “realist” version of Plato’s ideas. With that in mind, one is advised to put mysticism aside. However, throwing Plato’s theory out due to a rejection of mysticism is rather short sighted (as Plato commonly spoke in metaphor and it is doubtful he was truly implying anything mystic). As Cicero eludes in his De Officiis (On Duties), we don’t have to show how a moral concept came into existence to apply our reason to it and discuss why it is important. Thus, the takeaway here is: Let’s not get sidetracked by questioning to what degree Plato believed in the existence of forms as things-in-themselves that exist outside of the human experience and universe (as that is a question of speculation and pure metaphysics), and instead let’s focus on the story as a metaphor for the importance of seeking higher ideals and guiding others toward them. Phenomena and noumena: The Greeks, like Kant later would, consider the ideas of phenomena and noumena. Phenomena are the appearances and properties of things; that which constitutes what we can experience and sense. Meanwhile, noumena are posited objects or events that exist without sense or perception (that which, in theory, constitutes reality). In other words, the properties and effects of a thing that we can sense directly are phenomena, and the rest is noumena. All synthetic a priori judgements that tell us about the world are rationalizations about phenomena (like F=ma which describes the phenomena of force, mass, and acceleration). Understood loosely, 1. noumena is of the rational and phenomena is of the empirical, and 2.noumena is the thing-in-itself and phenomena is the effects (the manifestations of those things that can be perceived via the physical senses). TIP: See Kant’s theory of knowledge. NOTE: Empirically speaking, an object is a collection of properties (ex. a photon isn’t a widget with properties as far as we know; the only way to describe a photon is to describe its properties, its phenomena). From this perspective there is only phenomena in the physical world and noumena is just a metaphysical idea (at best describing a collection of properties; directly observable or not). With that said, loosely speaking, it helps to understand that we can have useful knowledge of an object beyond what we can sense about an object directly. Still, the takeaway is “the noumenal world may exist, but it is completely unknowable through human sensation… and therefore it is a purely metaphysical concept.” The main thing to note here then is, Plato’s allegory works very nicely as a metaphor… but it is a stretch to literally consider a concept like justice as existing as a true thing outside of its relationship to the human experience (I would personally consider “true justice” a valid and ideal concept, but one that exists because of the nature of the universe, not despite of the nature of the universe). The above is what Plato’s “allegory of the cave metaphor” is about, and frankly this is what much of philosophy in general is about (especially virtue theory or any sect of metaphysics which has to deal with that which is idea and not physical manifestation). The concept is simple, it is that ideas are sometimes more real than what we can know directly via our senses. From there, the directions one can take the metaphor are vast. After-all, it is a metaphor that touches on Enlightenment, the Highest Good, and the use of Reason, so it is going to apply to a variety of heady discussions. TIP: If you want the text-book version, see The Allegory of the Cave. Below we explain the essence of the concepts behind the Allegory. “Then now let us return to the previous discussion. Is that idea or essence, which in the dialectical process we define as essence of true existence-whether essence of equality, beauty, or anything else: are these essences, I say, liable at times to some degree of change? or are they each of them always what they are, having the same simple, self-existent and unchanging forms, and not admitting of variation at all, or in any way, or at any time?” – Plato’s Pheado in which the “essence” of the “formless forms” are discussed. Natural Philosophy contains physics (here understood as all physical things, not Newton’s physics, but all material objects that form the aesthetic) and logic (pure reason like the pure practical reason of mathematics and theoretical physics) and Moral Philosophy contains ethics (like a lawyer’s rule-set, any action, especially what we consider “ethical” action) and metaphysics (the potentially unprovable pure morals behind the lawyer’s rules; pure philosophy). All we can know empirically is “the physics” (the natural world or phisis), yet there are three other vital categories of human understanding to cover! There is logical knowledge, which we can’t know directly, but we can confirm empirically like 1+1=2 or F=ma. This is logic (or logos). Here, just knowing that we can cross pure reason and pure physics is the key (this concept is covered by Hume’s fork). Then, once we confirm we can have knowledge of physics and logic, we can then move toward understanding ethics (or ethos). We can’t fully confirm ethics (our morals and logic in-action), but we can have reasonable empirical and logical knowledge about ethics (after-all, we all agree on a set of laws almost without questioning it). Then lastly, we have to seek to know the unknowable forms, the forms of that most elusive of categories, metaphysics. Metaphysics contains the highest forms. This includes the moral principles upon which our ethics are based (like duty and justice), and the more physical manifestations like our emotion (our pathos). We can’t know the arete of the Highest Forms directly, and thus we can’t hold “justice” or “moral goodness” in our hand, yet it is the spring from which all else flows, so we can hardly ignore it. Thus we have a catch-22, we can know that there is Higher forms, we can know they are the spring from which other things are flowing (in some respects), yet we can’t have certainty about them. There is actual no good solution to this aside the joy of setting down the path toward knowing (the path toward wisdom, AKA the love of wisdom, AKA philosophy). We can, at best, simply see reflections of the highest forms on the cave wall. When the empiricists derived just laws from the natural law, as it was with Locke or Mill, they were extracting the laws of the higher forms by analyzing their shadows. As we move away from accepting the physical shadows as reality, and move toward understanding the forms as they appear in logic, physics, and metaphysics, we move toward enlightenment and move toward knowing. Moving toward knowing is, as far as any good philosopher can tell, indicative of the highest moral good. From there, we can apply this metaphor in countless ways, it both stands as a general metaphor for Plato’s Republic and the Matrix. Why does this theory work so well? Well, you should already know the answer, and that is “it is a truism that exists outside of our reach that we can see shadows of dancing on the cave wall, be we Plato, or Cicero, or Locke, or Wachowski… That and, you know, the use of reason.